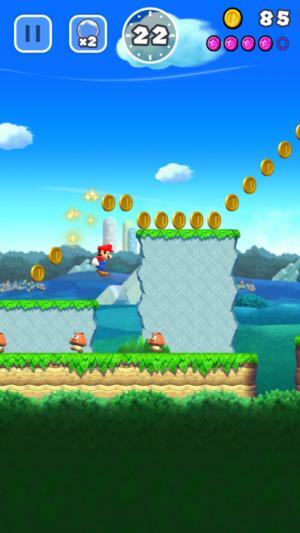 Mario's iPhone and iPad debut is streamlined, but still plenty Super indeed. Talk about a sweet gift for the holidays: Super Mario Run just hit the App Store on Thursday, and this late-year release is easily one of the most anticipated iPhone and iPad games to date. Nintendo’s game takes the full-fledged Super Mario side-scrolling experience that we’ve seen for the last 30-plus years and streamlines it for touchscreens and one-handed play. Super Mario Run is a bit different from the old-school entries, no doubt, and the changes can feel awkward at first—especially if you’re used to having multiple buttons and a directional pad, not to mention a lot more control over the portly plumber. But the compromises here mostly work well, although with a $10 buy-in for the complete game following the free demo stages, it’s understandable that some people are wary. Luckily, Super Mario Run doesn’t lose the classic magic. After a day of play, here’s what we think of Nintendo’s first real mobile game. It’s Mario! On your iPhone! 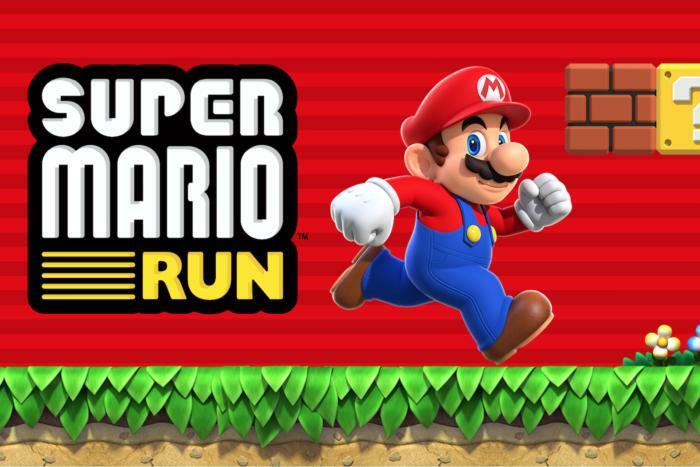 Super Mario Run takes cues from the New Super Mario Bros. series that started on Nintendo DS, with the same blend of classic 2D gameplay with fresh 3D graphics, but everything is a bit smaller and simpler. This is a one-handed, one-tap game, and Mario automatically sprints to the right through each of the 24 levels: you’ll tap to jump, primarily, as you leap over gaps, stomp on Goombas, and grab coins. Classic Mario stuff, of course. There are new tweaks, however. Part of that streamlining effort is letting Mario take care of some simpler tasks on his own. He’ll automatically climb short ledges, and if he approaches a common enemy, he’ll just vault over it on his own—but you can tap at the point of contact to make a stylish leap and gain a coin in the process. Also, there are new Pause Blocks in the floor that automatically bring Mario to a halt, giving you a chance to assess the hazard ahead, along with blocks that vault Mario ahead or into the air when you tap. Super Mario Run can get tricky, although simply clearing stages isn’t tremendously difficult. As a longtime Mario player, those last additions have been the most jarring: learning not to manually stop Mario, but to be stopped and then have to restart his feet, for example. After a day, it still hasn’t fully clicked for me, and I think it’s partly due to being conditioned by mobile endless runner games in which constant movement is the norm. 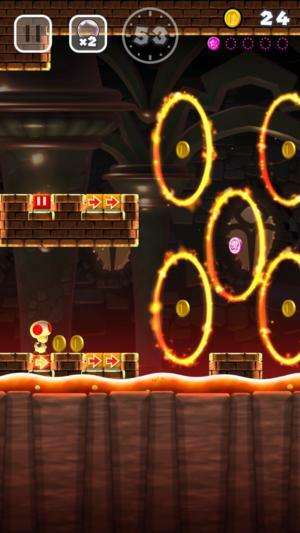 Although Super Mario Run’s interactions are extremely simple, the stages are loaded with complications and hazards, and the experience gains a different kind of rhythm as a result. That’s not a complaint, but I feel like the wonderful Rayman Fiesta Run took a smoother approach to this, as it had you moving more consistently and then using taps and swipes for various contextual actions. However, Nintendo’s design works once you get a hang of it, and other additions—like blocks that flip you backwards when you jump off of them—are clever complements to the one-tap approach. You’ll find 24 stages to play and replay again to complete bonus objectives. 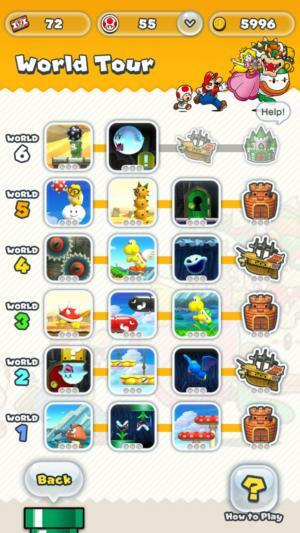 The World Tour is the meat of the Super Mario Run experience, delivering a progression of 24 courses including tougher end-world levels with boss battles. Although all of these are based on familiar themes and play mechanics from the Super Mario series, the actual levels are fresh creations for Run, and they all make a lot of sense for the kind of pacing found here. At their best, the stages feel deliberately choreographed to keep you running, jumping, and flipping ever ahead without interruption. And they’re thankfully diverse, too. Drawing from that incredible gaming history, the levels show how much variety is found in the franchise—and not just visually, either. You’ll find lighter run-and-jump courses, hazard-packed ones that require precise timing, and spooky ghost stages that bring in more of a puzzle-solving element. Many stages also utilize the portrait orientation of the phone to deliver more upward navigational experiences. Played correctly, each stage typically only takes a couple minutes to clear, but you may log numerous attempts trying to figure out how to overcome some of these enemies and platform challenges before succeeding. Ultimately, the World Tour can be cleared within a couple of hours, but there’s incentive to revisit these stages: you might want to go back and collect all five of the pink coins in each level, or try to notch a higher coin tally than your friends. You can also unlock extra playable characters, each of which has its own unique feel and abilities, which could motivate some return trips. Put up the better run in Toad Rally and you’ll gain some of the little guys for your kingdom. 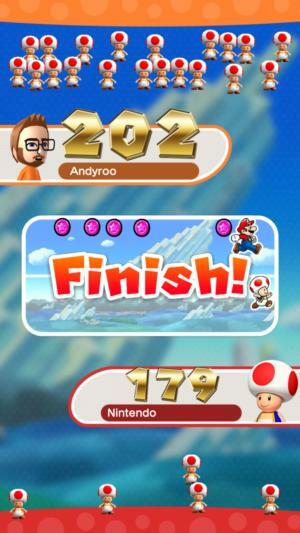 Aside from the tour, there’s also the asynchronous multiplayer challenges of Toad Rally mode. You’ll pick an opponent from the list and then race against the A.I. version of that online player, with the goal of collecting the most coins and yielding the most Toad fans in the process. It’s a battle for speedy, coin-grabbing supremacy, but also for amassing resources: those Toads then show up in your kingdom on the menu screen, and you’ll need them to unlock some of the buildings you can pop onto the Kingdom Builder map. 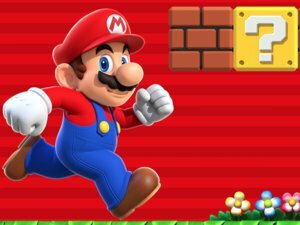 Friends who also play Super Mario Run can be added via annoying 12-digit codes (typical Nintendo), or more easily via Facebook and Twitter connections. It’s also worth linking or creating a My Nintendo account, as well, since you’ll unlock Toad as a playable character and earn some other rewards in the process. And definitely note: you’ll need a consistent Internet connection to play, even in the World Tour. Nintendo says it’s an anti-piracy measure, but that’s one big drawback here. Mario probably won’t be a very good holiday flight companion, after all. This is a quality Nintendo game. Nintendo 3DS games are typically $40 a pop. The scope-to-price ratio makes sense here. Nintendo’s demo-like approach lets you download Super Mario Run for free and play through the first three levels, as well as get a 20-second taste of the first end-world stage—and then it stops there unless you pay $10 for the full game unlock. 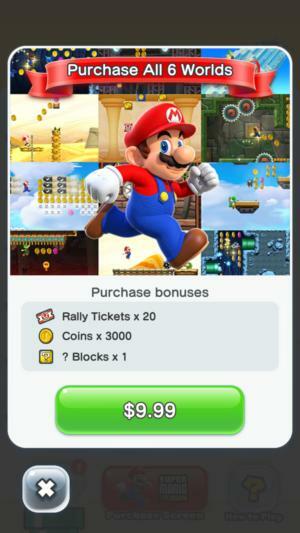 You’ll find no ad banners or other in-app purchases for premium currencies or power-ups; this isn’t a freemium game. It’s a premium one, but you don’t have to make that purchase immediately. Expectedly, people are mad about this. One App Store review I read this morning claimed that asking for payment makes this is “a sham that Nintendo should be ashamed of.” Look, I’m a big proponent of paying for quality things that people create, which shouldn’t be a controversial or unpopular opinion. Nintendo built something that is joyful, imaginative, fun, and terrifically polished. That said, $10 is a larger-than-usual ask for a mobile game, so I understand some resistance… even if much of the criticism tends to be caustic and obnoxious. I happily paid for the full game, and Super Mario Run is well worth the expense. We should pay for quality experiences, and we should reward developers for making smart adaptations to bring their best games to mobile. Millions of players keep unimaginative dreck like Mobile Strike or Game of War: Fire Age on the Top Grossing apps chart, happily pumping in money for in-app purchases. However, they’ll grumble about the one-time purchase of a game that is full of personality, not to mention precision-crafted and balanced for fun and challenge—instead of pushing players to continually spend cash. If you try the free levels and don’t think you’ll get $10 of fun out of Super Mario Run, then that’s totally fair. It’s not mind-blowing or wholly innovative stuff: the game adapts a familiar formula to make it work well on your phone, but this isn’t a genius reimagining like Nintendo’s own Super Mario Galaxy or Super Mario 3D Land. It is a lot of fun, though, and if you love Mario and have a soft spot for Nintendo’s particular brand of gaming bliss, then it should bring you plenty of pleasure through the holidays ahead.